Now that the Republican presidential primary calendar has been moved into January, the Crystal Ball this week is taking a special, in-depth look at why it happened, what it means for the campaign and how it can be prevented next time. With 13 months still to go before the end of another presidential cycle that began the day after the last one finished, it’s worth asking: Does it have to be this way? The First Amendment guarantees candidates an unfettered campaign of indeterminate length. If you wanted, you could today declare for president in 2016 or beyond. A handful of ambitious politicians have doubtless already written the announcement in their heads. Luckily for the rest of us, they will say nothing publicly. This is not new. American history is replete with examples of lengthy campaigns and multiyear chess games. Thomas Jefferson conducted a quiet effort against John Adams for the four years he was vice president to Adams, having lost a close Electoral College battle to him in 1796. Andrew Jackson never stopped running for president after he believed he was robbed of the office in 1824 by John Quincy Adams. Both these long-distance runners were rewarded with the White House. What is novel, though, is the growing length of the overt public campaign for party nominations. For that we can largely thank Jimmy Carter. Before 1976, extensive private preparations notwithstanding, candidates almost always waited until the actual calendar year of the election before announcing their candidacy. Carter changed that when he practically became a resident of Iowa, site of the country’s first nominating contest, shortly after he left office as governor of Georgia in 1975. His successful strategy became the new norm, copied by candidates in both parties since. Two factors increasingly drive candidates to jump in early. First, the amount of money required to wage a credible national primary campaign has skyrocketed. Jimmy Carter raised $13.6 million for his 1976 primary campaign (including some federal matching funds); in 2008, Barack Obama raised $414 million. Even after adjusting for inflation, Obama raised about eight times more than Carter. Many of the legal restrictions on donations, such as low individual contribution limits, are being circumvented by the creation of “super” political action committees (PACs), but for most candidates it still takes a long time to raise tens of millions. There’s also the nominating calendar. From 1920 until 1972, the New Hampshire primary led off the presidential selection process on the second Tuesday in March. This helped to limit primary season to less than four months, until early June. Then the great rush to the front of the primary pack began, fueled by states’ desires to get the money, media and electoral influence that come with early voting. In 1972, Florida tried to grab New Hampshire’s franchise, setting its primary for the same mid-March day as the Granite State’s. New Hampshire promptly moved up to March 7. The leapfrogging has continued since and accelerated recently. In 1968, only New Hampshire held a March primary. By 1988 there were 20 March primaries. Inevitably, competition among states moved some of the March primaries into February, with a blizzard of 22 in February 2008. 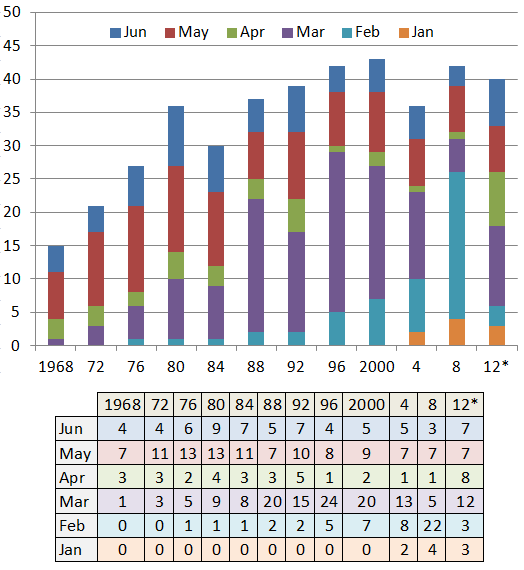 Chart 1 shows the number of primaries throughout the years and when they were held. As in 1972, Florida has again been the trigger for the acceleration of the 2012 nominating calendar. Its insistence on Jan. 31 as its primary date has forced Iowa, New Hampshire, Nevada and South Carolina to move into January or maybe even December. In 2008 the Iowa caucus was held on Jan. 3 — the earliest ever, requiring intense campaigning during the holidays. A repeat of that poorly timed event is now in the offing. The negative TV ads will suit commercial breaks during “The Grinch Who Stole Christmas,” but not much else. Season’s greetings. To their credit, Republicans tried to bring some order out of chaos this year, devising a thoughtful plan that limited the length of the nominating season by delaying its start until Feb. 6. The GOP leadership also provided incentives, such as additional delegates at the August nominating convention, for states to pick later primary dates. As a result there are currently more primaries scheduled in April, May and June 2012 than any year since 1992. Most states saw the wisdom in the new arrangement. It was fair to all candidates, giving the lesser-known ones time to raise money and gain recognition. The party’s voters had a rational, nicely paced schedule, so they could reconsider their choices as time went by and new information emerged. The goal is to pick a winner and a good potential president, after all. But then came Florida, willing to accept the penalties for breaking the rules — including halving its convention delegation — in order to get an early crack at settling the nomination. Will the Republican National Committee enforce its own punitive rules once a nominee is selected? It’s doubtful, given the decisive role that Florida might play in the general election. The Sunshine State is also hosting the GOP convention, another complication. A half-dozen other states also came close to violating the scheduling rules this year, or may still. Under the current arrangement, each state is an independent agent, with its own self-interest paramount. No political party has the clout to change this. A statute or constitutional amendment establishing a system of March-to-June regional primaries — with rotating order so that every state gets to be part of the first group every fourth election — would help. Even better, why not have the order of the regionals determined by lottery on New Year’s Day of the election year, so that candidates wouldn’t know until then where to begin their ground efforts? That would shorten the campaign season. Of course, this reform is likely to be enacted on the 12th of never. Until then, we’ll just have to content ourselves with a crazy-quilt, eternal campaign — an electoral purgatory of our own creation.